Posted on November 1, 2008 by Thomas J. Keegan, Jr. 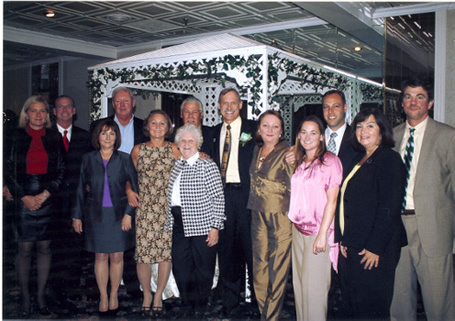 Partner Dan Ross (Far Right) and former Mayor Stephen Keegan (Second from the Left) flank Thomas J. Keegan, Jr. and his wife Peggy (Center) alongside other family members at the Chamber of Commerce dinner, held on October 28, 2008, where Mr. Keegan was featured as the 2008 honoree. Posted on October 1, 2008 by Thomas J. Keegan, Jr.
We’re happy to announce that Thomas J. Keegan Jr. has been elected to the Board of Directors of the Kiwanis Club of Patchogue for the 2008-2009 term! Posted on June 15, 2008 by Thomas J. Keegan, Jr.
On June 14, 2008 Thomas J. Keegan Jr. was awarded a certificate of appreciation from The Greater Sayville Chamber of Commerce for his contributions to the Irish American community on Long Island. Though the weather didn’t want to cooperate, the enthusiastic runners that showed up on May 4th would not let anything get in their way of running to benefit the children of River Elementary School. The race went on without a hitch and in an effort to not steal the limelight, sponsor Thomas J. Keegan Jr. came in at a modest 59 out of 132. 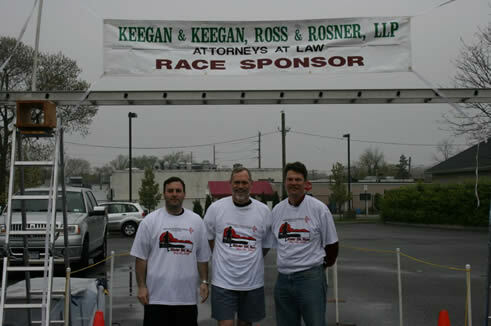 On Sunday, May 4, 2008, Keegan & Keegan, Ross & Rosner LLP will be sponsoring the third annual River 5k Run at River Elementary School in Patchogue. More information can be found at the Greater Long Island Running Club’s web site or you can view the announcement flyer (PDF format) here. As a River Avenue Graduate, Partner Daniel C. Ross is out to score as this year’s River Alum top finisher! Posted on March 17, 2008 by Thomas J. Keegan, Jr.
On March 16, 2008 Newsday solicited Thomas J. Keegan’s thoughts and opinions on the current state of the political world in the Village of Patchogue. The historic unopposed slate of Patchogue First candidates on election day March 18th was the subject of Mr. Keegan’s Newsday interview as a businessman for many years in Patchogue. On the week of February 24, 2008 Jamie G. Rosner, served as the Judge in a local High School Mock Trial. On September 28, 2007 the firm hosted a “thank-you” Barbecue for the officials and workers of Patchogue Village as well as Bove Company, the contractor that recently completed the beautiful resurfacing and complete reconstruction of North Ocean Ave. The newly installed period lighting adds a stunning evening panorama down this entryway to Patchogue in general and the Firm’s office in particular as one enters from the north. Firm “Matriarch”, Kitty Keegan was awarded a certificate of appreciation at Brookhaven Memorial Hospital by the Suffolk East Division of Kiwanis International for her invaluable assistance in the Second Hand Smoke Education Initiative.